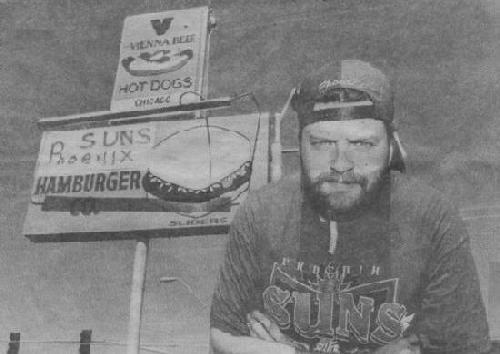 Chicago Hamburger Co. manager Dave Freidkin stands near the store sign, temporarily switched to draw business for the Finale. PHOENIX, Ariz – This borders on treason. Call it double entendre or double-crossing, but the Bulls’ clash with the Suns for the championship has brought out a strange double side from transplanted Chicagoans and the Chicago-themed establishments that serve them. According to the census, 191,000 people from Illinois now live in Arizona. Illinois produced more immigrants here than any state except next-door neighbor California. And just as sure as there are plenty of Grabowskis in the phone book, you can find the the Chicago Sports Bar, Chicago Title Insurance Company, Chicago Towers Pizza & Deli, Chicago Trust Company and Chicago’s Best Painting & Wallcovering. There’s also the Windy City Pawn Brokers, a place called Theo’s that served “Chicago Style Subs” (whatever those are) and Harry and Steve’s Chicago Grill (named after Messrs. Caray and Stone, the former owners). But a large number of Chicago-type restaurants are Chicago in name only. And these days, even that’s not always the case, as they try to cash in on Sunsmania. Just call the Chicago Hamburger Co. and listen to Dave Freidkin answer the phone. But it was the Chicago-born owner, Bob Pappanduros, who came up with the idea and the locals “love it,” Freidkin said. The ex-Chicagoans like it out here, and they have also come to like the Suns. “I’m pulling for the Suns because they represent the freewheeling West,” said journalist Mark Scarp, a native of Oak Park. Georgia Kanelos is even willing to bet her hair with her friends back in Chicago. “If the Bulls take it, they’re going to fly me back and shave my head,” she said. So easily converted. Don’t these people keep anything from their Chicago days?